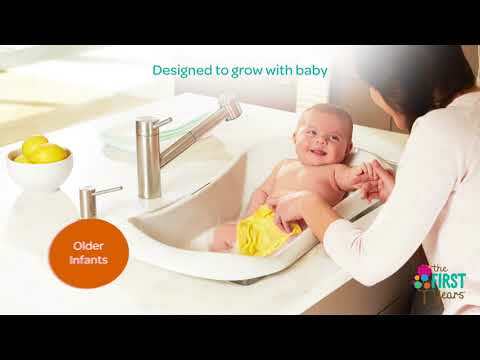 The 4-in-1 Warming Comfort Tub’s design helps you keep your growing baby comfortable during bath time. From infant through to toddler, this modular tub creates a secure and comfy environment for them as they get clean. The cleverly designed infant insert features a special water catch tray that allows for a steady stream of soothing water down your baby's neck and back. It also cradles newborns at a gentle incline and easily switches to a medium incline for older infants. The 4-in-1 Warming Comfort Tub’s design helps you keep your growing baby comfortable during bath time. From infant through to toddler, this modular tub creates a secure and comfy environment for them as they get clean. The cleverly designed infant insert features a special water catch tray that allows for a steady stream of soothing water down your baby's neck and back. It also cradles newborns at a gentle incline and easily switches to a medium incline for older infants. As your baby grows, remove the insert and the tub’s more upright incline easily supports an extra-wiggly baby during bath time. The tub later provides the perfect perch for a toddler having bath time fun. The tub is designed to fit most single and double sinks, and can also be used in an adult bath tub.